AN IRRIGATION system that reduces water consumption, increases yield and eliminates dependency on rainfall, is nothing short of a boon for farmers. A novel method of crop irrigation - surge irrigation - incorporating these features, is currently under trial on the experimental farms of Tamil Nadu University of Agriculture in Coimbatore. What makes this new system worth a mention is its promise to reduce agricultural water consumption by more than 50 per cent, while boosting up the crop yield by nearly 15 per cent. The system, reportedly, has the potential of saving 40 per cent of the present water supply during summer, and upto 60 per cent during the rainy season. Sigr@ificarttly, 70 per cent of the net sown area in India still depends on rainfall for cultivation. The problem is compounded by the fact that rains occur in heavy showers for short periods and a large proportion of it goes waste as runoff. The method of surge irrigation, apart from saving water, also ensures that minimum land is wasted as irrigation channels. Under the present 'basin farroV system of irrigation, upto 20 per cent of the land houses water channels and hence, goes waste. In surge irrigation, the fields are first levelled to avoid water stagnation in depressions. The c*op is then planted in single or double rows between furrows that are 60 cm apart in the former case, and 120 cm apart in the latter. A water supply channel that runs at right angles to the furrows bears a bund that is pierced at regular intervals by short inlet pipes. Each pipe is capped on the channel side to cut off the water flow when desired. To operate the system, water is let out of the source - a tank or a well - into the supply channel. Starting from' one end, 'a fixed number of inlet pipes are uncapped for a fixed time period. Water gurgles through the pipes and rushes down the length of the furrow. The pipes are recapped after the furrows are adequately filled with water. Studies indicate that this intermittent water supply reduces water run-off and deep percolation losses. Successfully tried out for sunflower cultivation, the tests are currently being conducted on maize. 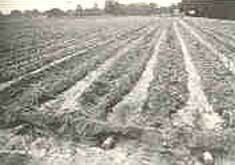 Surge irrigation is, however, ruled out for closely-planted crops like rice which requires standing water. It is ideal for crops like maize, cotton, tomato and brinjal. With trials of all major crops on the anvil, researchers are now looking into means of perfecting the system.